They said that Bolivia’s quinoa exports were leaving its people hungry, that the world delight in white quinoa was leading to the loss of other seed varieties, and that Bolivian farmers were well off. They were wrong. While Bolivians, like all people worldwide are consuming more quinoa than ever before, today’s farmers are living on less than $2 day facing 70% crop losses due to drought and a 20% decline in export market access. alone in the vast windswept altiplano desserts as men and older siblings leave for cities and other countries in desperate search for work. The unsaid is the stoic spiritual connection that compels the altiplano farmers to persist despite all odds. The thousands year old shared memory of the Gods’ gift of quinoa, their role as keepers of the world’s food and the sustainers of humankind – at all costs, and their never faltering love and adoration of Pachamama, mother earth, the true mother who they will never abandon and through prayer and ritual, they hope will never abandon them. Bolivian woman with quinoa harvest from a newer lowland quinoa growing region. The unsayable is that in the dark, dusty, adobe-walled kitchens, crude clay pots and patched flour sacks, lies a culinary treasure to rival even the greatest ingredients of Europe. There are thousands of varieties of quinoa that to the farmers are like their own children – they love and nurture them, respecting each variety’s own special property, way of growing, formation and quality. They caress them as seed buds, help support them as seed heads, lovingly harvest them one at a time – crushing and processing the seeds – all by hand. 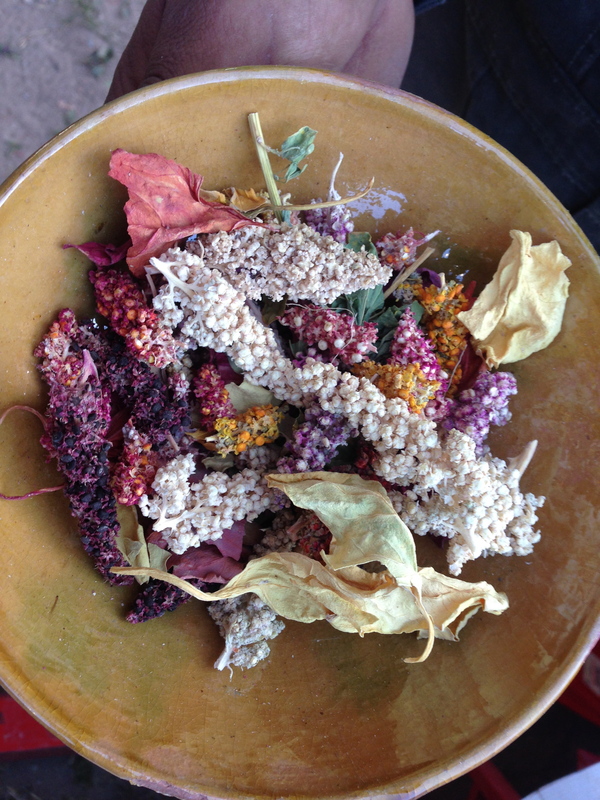 Marveling at the quinoa colors, textures and properties. The seeds are never mixed and are carefully used for specific recipes – soups, steamed dumplings, breads, cookies, as rice, cereal, and a hot and cold beverage. These recipes originated from the ancestors and go back thousands of years to pre-Inca times. This is how quinoa is consumed in the remote Bolivian countryside today. And nobody knows it.